The Museum of Pop Culture, or MoPOP (previously called EMP Museum) is a nonprofit museum dedicated to contemporary popular culture. It was founded by Microsoft co-founder Paul Allen in 2000 as the Experience Music Project. Since that time MoPOP has organized dozens of exhibits, 17 of which have toured across the US and internationally. MoPOP is home to exhibits, interactive activity stations, sound sculpture, and various educational resources. A 140,000-square-foot (13,000 m2) building, designed by Frank O. Gehry, that houses several galleries and the Sky Church, which features a Barco C7 black package LED screen, one of the largest indoor LED screens in the world. Exhibits that cover pop culture, from the art of fantasy, horror cinema, and video games to science fiction literature and costumes from screen and stage. Interactive activities included in galleries like Sound Lab and On Stage where visitors can explore hands-on the tools of rock and roll through instruments, and perform music before a virtual audience. The largest collections in the world of artifacts, hand-written lyrics, personal instruments, and original photographs celebrating the music and history of Seattle musicians Nirvana and Jimi Hendrix. Educational resources including MoPOP's Curriculum Connections in-museum workshops and outreach programs; STAR (Student Training in Artistic Reach); Creativity Camps for Kids; Teen Artist Workshops; Write Out of This World, an annual sci-fi and fantasy short story contest for 3rd to 12th graders; and the Hip-Hop Artist Residency. Public programs such as MoPOP's Science Fiction + Fantasy Short Film Festival, Pop Conference, the Youth Advisory Board (YAB), and Sound Off! the Northwest's premier battle-of-the-bands. MoPOP was the site of the concert and demo program of the first NIME workshop, which subsequently became the annual International Conference on New Interfaces for Musical Expression, a leading venue for cutting edge research on music technology. 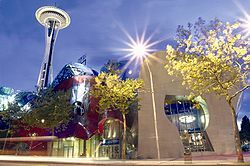 The Science Fiction Museum and Hall of Fame was founded by Paul Allen and Jody Patton and opened to the public on June 18, 2004. It incorporated the Science Fiction and Fantasy Hall of Fame which had been established in 1996 (below). The museum was divided into several galleries with common themes such as "Homeworld," "Fantastic Voyages," "Brave New Worlds," and "Them!" Each gallery displayed related memorabilia (movie props, first editions, costumes, and models) in large display cases, posters, and interactive displays to sketch out the different subjects. "From robots to jet packs to space suits and ray guns, it's all here." Members of the museum's advisory board included Steven Spielberg, Ray Bradbury, James Cameron, and George Lucas. Among its collection of artifacts were Captain Kirk's command chair from Star Trek, the B9 robot from Lost in Space, the Death Star model from Star Wars, the T800 Terminator and the dome from the film Silent Running. Although the Science Fiction Museum as a permanent collection was de-installed in March 2011, a new exhibit named Icons of Science Fiction opened as a replacement in June 2012, at which time the new Hall of Fame display was unveiled and the class of 2012 inducted. The Science Fiction and Fantasy Hall of Fame was founded in 1996 by the Kansas City Science Fiction and Fantasy Society (Kansas City, Missouri) and the Center for the Study of Science Fiction (CSSF) at the University of Kansas (KU). The chairmen were Keith Stokes (1996–2001) and Robin Wayne Bailey (2002–2004). Only writers and editors were eligible for recognition and four were inducted annually, two deceased and two living. Each class of four was announced at Kansas City's annual science fiction convention, ConQuesT, and inducted at the Campbell Conference hosted by CSSF. The Hall of Fame stopped inducting fantasy writers after 2004, when it became part of the Science Fiction Museum affiliated with MoPOP, under the name "Science Fiction Hall of Fame". Having inducted 36 writers in nine years, in 2005 it began to recognize non-literary media. It retained the quota of four new members and thus reduced the annual number of writers. The 2005 and 2006 press releases placed new members in "Literature", "Art", and "Film, Television and Media", and "Open" categories, one each. In 2007 and 2008 the fourth inductee was placed in one of the three substantial categories. MoPOP de-installed the Science Fiction Museum in March 2011. When the exhibition "Icons of Science Fiction" opened in June 2012, a new Hall of Fame display was unveiled and the class of 2012 inducted. Nominations are submitted by the public but the selections are made by "award-winning science fiction authors, artists, editors, publishers, and film professionals." MoPOP restored the original name online during June 2013 and announced five new members, one daily, beginning June 17. The first four were cited largely or wholly for science fiction but the last was J.R.R. Tolkien, "hailed as the father of modern fantasy literature". The class of 2017 brings the number of members to 92, plus twenty extra added in 2016 to celebrate the 20th anniversary of the museum. 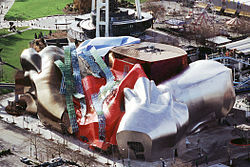 MoPOP is located on the campus of Seattle Center, adjacent to the Space Needle and the Seattle Center Monorail, which runs through the building. The structure itself was designed by Frank Gehry and resembles many of his firm's other works in its sheet-metal construction, such as Guggenheim Museum Bilbao, Walt Disney Concert Hall, and Gehry Tower. Much of the building material is exposed in the building's interior. The building contains 140,000 square feet (13,000 m2), with a 35,000-square-foot (3,300 m2) footprint. The name of the museum's central Sky Church pays homage to Jimi Hendrix. A concert venue capable of holding up to 800 guests, Sky Church boasts 70-foot ceilings, state-of-the-art sound and lighting, and a mammoth indoor HD LED screen. The last structural steel beam to be put in place bears the signatures of all construction workers who were on site on the day it was erected. Hoffman Construction Company of Portland, Oregon, was the general contractor. Magnusson Klemencic Associates of Seattle were the structural engineers for the project. Even before groundbreaking, Seattle Weekly said the design could refer to "the often quoted comparison to a smashed electric guitar." Indeed, Gehry himself had made the comparison, "We started collecting pictures of Stratocasters, bringing in guitar bodies, drawing on those shapes in developing our ideas." The architecture was greeted by Seattle residents with a mixture of acclaim for Gehry and derision for this particular edifice. 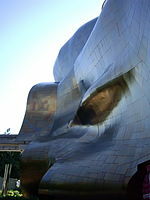 "Frank Gehry," remarked British-born, Seattle-based writer Jonathan Raban, "has created some wonderful buildings, like the Guggenheim Museum in Bilbao, but his Seattle effort, the Experience Music Project, is not one of them." New York Times architecture critic Herbert Muschamp described it as "something that crawled out of the sea, rolled over, and died." Forbes magazine called it one of the world's 10 ugliest buildings. Others describe it as a "blob" or call it "The Hemorrhoids". Despite some critical reviews of the structure, the building has been called "a fitting backdrop for the world's largest collection of Jimi Hendrix memorabilia." The outside of the building which features a fusion of textures and colors, including gold, silver, deep red, blue and a "shimmering purple haze," has been declared "an apt representation of the American rock experience." The museum has had mixed financial success. In an effort to raise more funds, museum organizers used Allen's extensive art collection to create a 2006 exhibit within the confines of the MoPOP. The exhibit was entitled DoubleTake: From Monet to Lichtenstein. The exhibit included Roy Lichtenstein's The Kiss (1962), Pierre-Auguste Renoir's The Reader (1877), Vincent van Gogh's Orchard with Peach Trees in Blossom (1888), Pablo Picasso's Four Bathers (1921) and several works of art from Claude Monet including one of the Water Lilies paintings (1919) and The Mula Palace (1908). Since then the museum has organized numerous exhibitions focused more specifically on popular culture: Sound and Vision: Artists Tell Their Stories, which opened February 28, 2007, for example, brought together both music and science fiction in a single exhibit, and drew on the museum's extensive collection of oral history recordings. The museum's recent exhibitions have ranged from horror cinema, video games, and black leather jackets to fantasy film and literature. ^ Frank Hammel. "PLSN - Seattle's EMP Equipped with High-Res LED Display for Sky Church Music Venue". plsn.com. Archived from the original on 2013-09-29. Retrieved 2013-07-26. ^ "Archived copy". Archived from the original on 2016-02-02. Retrieved 2016-02-06. CS1 maint: Archived copy as title (link) More than 500 musical instruments and 30 computers were used to create IF VI WAS IX. Created by Seattle-based sound sculptor, Trimpin, IF VI WAS IX is equipped with earphones that allow audiences to tune into the various musical permutations performed. ^ "Science Fiction Museum and Hall of Fame". Travel Guides: Seattle. The New York Times. July 7, 2009. Archived 2009-07-07. Retrieved 2013-04-27. Footer: "Content Provided by Frommer's Unlimited. Excerpted from Frommer's Seattle 2009 © 2009 [ — space — ] Powered By Frommers". ^ a b Kareiva, Celina (January 19, 2012). "Coming to EMP: Hendrix, AC/DC — and some leather, too". The Seattle Times. Retrieved 2012-01-22. ^ a b "Guide to EMP's 'Icons of Science Fiction'". CBS Seattle. May 22, 2012. Retrieved 2013-03-29. 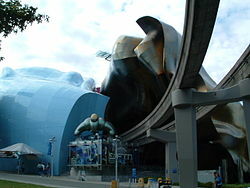 ^ a b c "Science Fiction Hall of Fame: EMP Museum Announces the 2012 Science Fiction Hall of Fame Inductees". EMP Museum (empmuseum.org). Version 2011–2012 at Internet Archive. Archived 2012-07-22. Retrieved 2013-03-19. ^ a b c "Science Fiction and Fantasy Hall of Fame" Archived 2013-05-21 at the Wayback Machine (official website to 2004). Retrieved 2012-04-25. ^ "Science Fiction and Fantasy Hall of Fame". 2005(?). Center for the Study of Science Fiction (sfcenter.ku.edu). University of Kansas. Retrieved 2013-06-25. ^ a b "It's Official! Inductees Named for 2005 Hall of Fame Class". Press release March 24, 2005. Science Fiction Museum (sfhomeworld.org). Archived 2005-03-26. Retrieved 2013-03-22. ^ a b "Presenting the 2006 Hall of Fame Inductees". Press release March 15, 2006. Science Fiction Museum (sfhomeworld.org). Archived April 26, 2006. Retrieved 2013-04-01. ^ a b "Science Fiction Hall of Fame to Induct Ed Emshwiller, Gene Roddenberry, Ridley Scott and Gene Wolfe". Press release March/April/May 2007. Experience Music Project and Science Fiction Museum and Hall of Fame (empsfm.org). Archived 2007-10-14. Retrieved 2013-03-19. ^ a b "2008 Science Fiction Hall of Fame Ceremony Tickets On Sale May 15". Press release April/May 2008. Experience Music Project and Science Fiction Museum and Hall of Fame (empsfm.org). Archived 2008-05-10. Retrieved 2013-03-19. ^ a b "Science Fiction and Fantasy Hall of Fame" Archived 2016-02-07 at the Wayback Machine. 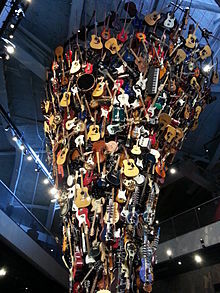 EMP Museum (empmuseum.org). Retrieved 2014-06-27. ^ a b "Science Fiction and Fantasy Hall of Fame". [June 17 to 21, 2013]. EMP Museum (empmuseum.org). Archived 2013-06-23. Retrieved 2014-07-21. ^ "Science Fiction Hall of Fame". Science Fiction Awards Database (sfadb.com). Mark R. Kelly and the Locus Science Fiction Foundation. Retrieved 2014-07-21. ^ "2015 SF&F Hall of Fame Inductees & James Gunn Fundraiser". June 12, 2015. Locus Science Fiction Foundation (locusmag.com). Retrieved 2015-07-16. ^ a b "2016 SF&F Hall of Fame Inductees". Locus. Locus SF Foundation. Retrieved 15 June 2018. ^ "Stan Lee and J.K. Rowling to Be Inducted into Science Fiction & Fantasy Hall of Fame". ComicBook.com. Retrieved 15 June 2018. ^ "Science Fiction and Fantasy Hall of Fame: 2017 Inductees". MoPOP. Retrieved 15 June 2018. ^ Daniels, Chris (Nov 15, 2016). "Experience Music Project gets new name: MoPOP". KING5 News. Retrieved 15 November 2016. ^ "404 - Page Not Found" (PDF). modernsteel.com. Archived from the original (PDF) on 2013-11-13. Retrieved 2018-12-30. ^ a b Raban, Jonathan (April 4, 2004). "Deference to nature keeps Seattle from becoming world-class city]". Seattle Times. Retrieved 2006-11-24. ^ a b Barnett, Erica C. (June 17, 2004). "EMPty: The Experience Music Project is a flop on all fronts—financial, musical, and intellectual". The Stranger. Retrieved 2006-11-24. ^ Cheek, Lawrence W. (September 26, 2006). "On Architecture: Corrugated steel is a nice wrinkle". Seattle Post-Intelligencer. Archived from the original on January 20, 2012. Retrieved 2006-11-26. ^ "Experience Music Project Review""Experience Music Project Review". Seattle. Fodor's Travel Guides (fodors.com). Archived 2010-08-18. Retrieved 2013-04-27. ^ Enlow, Clair (July 12, 2000). "Frank Gehry Rock Temple". Architecture Week 9. ^ Skelton, Lauren (2008). "EMP: Experience Music Project". Seattle.net. Archived 2010-06-15. Retrieved 2013-04-27. ^ Associated Press (March 22, 2005). "Experience Music Project still struggling five years later". USA Today. Retrieved 2006-10-22. ^ Farr, Sheila (November 29, 2005). "Paul Allen's Experience Art Project" Archived 2011-05-24 at the Wayback Machine. Seattle Times. Retrieved 2006-10-22. ^ "Full List of Works Announced for Upcoming DoubleTake: From Monet to Lichtenstein Exhibition". Press release. March 21, 2006. Retrieved 2006-10-22. ^ • "The EMP|SFM Oral History Program". Programs / Oral History. Experience Music Project and Science Fiction Museum (empsfm.org). Archived 2007-09-21. Retrieved 2013-03-19. • "The EMP|SFM Oral History Program". Programs / Oral History. EMP Museum (empmuseum.org). Archived 2011-05-19. Retrieved 2013-03-19. Wikimedia Commons has media related to Museum of Pop Culture. This page was last edited on 16 April 2019, at 00:25 (UTC).